Whenever you open blogger post editor to Create A New Post or edit and existing post, you see a "Post Settings" menu on the right side of the Post editor window. These post settings help you in creating a SEO optimized post and manage it as per your requirements. There is a need to understand this menu to use it perfectly. Novice bloggers don't take care of it so they get defeat in SEO race. I am explaining the Post Settings menu here so you may understand these settings. 1. Labels: The first option in post settings is Labels. These are used to tag a post with specific keywords. These keywords help search engines to reach at your blog when user searches something. These labels are also used to categorize different posts under a single Tag by tagging all of them with the same label. These are also helpful for those who want to add menus in their blog so to represent their blog in a disciplined manner. They tell about the nature of content in your post. 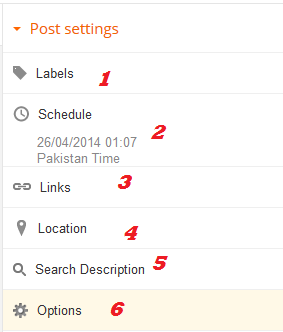 To use labels option, click on label button and write different labels which you want to assign for your post. You can write maximum 200 characters including spaces. You have to separate the different labels or tags by use of comma ",". 2. Schedule: This option is to set date and time for your post. There are further two sub-options in this option. a) Automatic: If you have chosen automatic, which is also by default, your posting date and time will be current time when you publish the post. b) Custom: You can set date of your own choice with this option. You can either set any past date to show your post at the older pages. If you want to schedule your post at any future date, you can also set time and date for it in future. Your post will be automatically published at that time and date. 3. Links: This option is used to create a URL (Permalink) for your post. Your links help most in explaining the user what type of content your article contains. By default, the blogger setting is set to Automatic permalink where the title of your post becomes the permalink of your post. There is also another option of choosing a custom permalink in which you can create a permalink of your own choice. Title link and Enclosure links are also two other options but they are not of any use for normal blogger. 4. Location: If you enable this option, then your readers will be able to see from where you have posted your blogger post. Blogger will automatically detect your location and share it with your readers. 5. Search Description: This is the meta description of your post in blogger. A snippet of this description might appear in the search engines below the title and url when your post is indexed in any search engine. Here is an example of search description. If you don't write any search description for your post, then search engines will show their desired search description for webpage. Previously, bloggers could not write separate description for their posts but now it is possible by this option so you should make full of it and write some unique search description to attract readers. 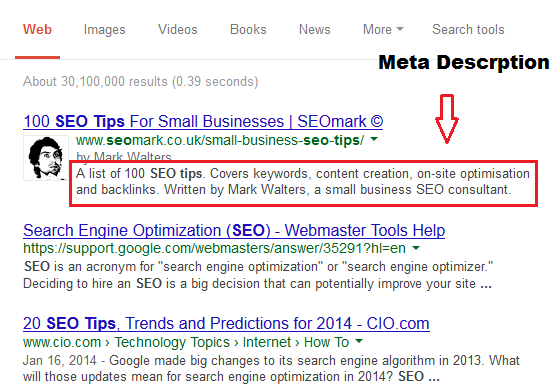 This doesn't effect your SEO index but helps readers to specify your post in search engines. That is why you must have write search description which attracts readers.